I spent the last week in Groton, Connecticut. They don't call it Rotten Groton for nothing. This was my third work trip in six weeks. Needless to say I am beyond happy to be home and have all this traveling behind me. I was only gone for six days, but it felt like six months. Unlike my first two trips, this trip was an actual working trip and critical to the Navy. Also unlike the first two trips, I was traveling with a group of people that I actually work with. Even though traveling alone is lonely, it is so much easier than traveling in a big group. Trying to coordinate rental cars, transportation to meals, and who is driving where and who is in which vehicle is just a cluster-you-know-what. We headed east on Sunday, and it only took us 16 hours to get from here to Groton. We had some weather delays at Dulles, but were finally able to fly into Providence and then made the hour drive south. The transition from Pacific to Eastern time is never easy - especially when you don't get in until midnight. The alarm going off on Monday morning was not a welcomed sound. The purpose of our trip was to go on-board one of our boats (submarines) for a validation of their equipment. This year we validated the USS New Mexico. 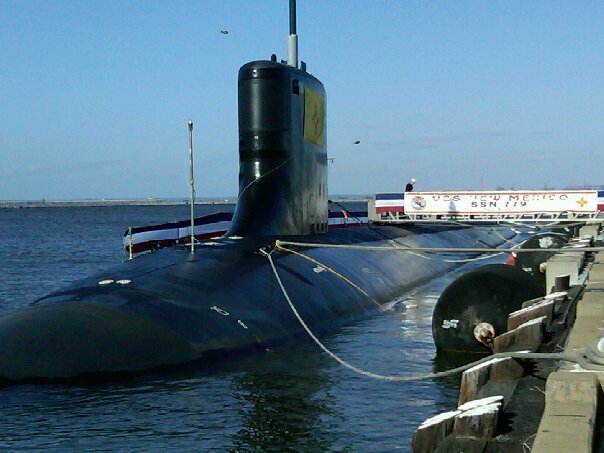 Since we manage the configuration for one particular class of submarines, they are all the built same. Last year we validated the North Carolina and the New Hampshire. When we stepped on-board, in some ways I felt like last year was last week. My teammate/partner, Jerry and I got to validate in the engine room, and that was more than fine by me. It is quiet and the air temperature was cool and comfortable. Some other areas of the boat are really crowded, really hot and really stuffy. This whole validation is one big scavenger hunt, and as a group we were looking for 2,500+ different parts or pieces of equipment. Normally scavenger hunts have some sort of prize, and this was no different. The only difference was that the prize was finding the part, and hoping that the information on the part matched what was listed on your information sheet. Since I am quite a bit younger than Jerry, with better/stronger eyes and a slimmer, more limber body, I did a majority of the crawling around the first few days. I think it is safe to say that I could earn a Masters in identifying valves and a PhD in using a flashlight and mirror to read the label plate information off these valves backwards and upside down. That is no easy task, folks. Not to mention contorting my body into the strangest positions to get to the valves in order to read them. After breathing in all the recycled air on the airplane, in the hotel, and on the boat... I was not too surprised when I started feeling funky. The funk quickly progressed into a nasty sore throat and after Wednesday, it was Jerry who was doing most of the crawling and calling out of part numbers. I lost count of how many times I was told, "You look terrible." I didn't care. Terrible was how I felt. I'm one of those people that doesn't really like to take any medicine for stuff unless I really have to. But since I wasn't just sitting at my desk all day, and sure as hell wasn't going to use sick leave and sit at the hotel all day - I went to Target to get some supplies to try and help. While at Target, I had two interesting experiences. First, I saw a woman using her bra as a cell phone holder. She literally pulled her shirt away from her body and stuck her iPhone in her bra. The second happened while I was waiting in line to pay for my goods. An older man in front of me was buying a frozen pizza. He asked the cashier, "If the pizza is thawed by the time I get home - can I return it?" What? What kind of question is that? Our days on the boat were long, long, long. I'm not used to being in my steel-toed boots all day. I can't even begin to count or guess the number of times I got turned around on the boat and was trying to figure out which side was port, and which was starboard. And I absolutely can't tell you how many times I whacked my head, knees or elbows, or scraped my back on something after being squatted down in my search. My sore throat somehow gravitated north and before I knew it, I was (oh, still am!) all congested and felt like I needed to prick my noodle with a pin to relieve the pressure. On Friday afternoon, our team lead started talking about the next validation. I told him I didn't want to hear the words "the next one" for awhile. My co-worker, Peggy and I got to fly home on Friday evening. We flew from Providence to Detroit. 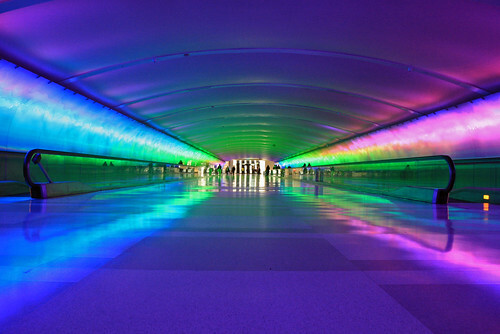 When we got to Detroit we had to walk to a different terminal than we arrived in. To get to this other terminal we walked through a tunnel. The tunnel walls were changing colors, and music was playing in the background. As we were walking through, Peggy said, "This is what I would imagine it is like being on LSD." It was pretty psychedelic. We landed at SeaTac at midnight and it was nearly 2:00 AM by the time I got home. The last thing I was thinking about before falling asleep was how happy I was to be home with my hubby and pups, and that I had been awake for 24 hours. What a way to end the trip.